A Baltimore teenager whose case was cited as an example of draconian policing has caught a break. Probation, community service and an apology will save him from life in prison on charges of rioting, a judge has decided. Allan Bullock was sentenced on Tuesday to 12 years in prison, with all but six months of the sentence suspended. He will have to serve five years of probation, 400 hours of community service, pass a General Educational Development (GED) test and write a letter of apology to the Baltimore Police Department, WZJ-TV reported. Bullock, now 19, pleaded guilty in February to one count of rioting and three counts of malicious damage to property over his actions on April 25 last year. 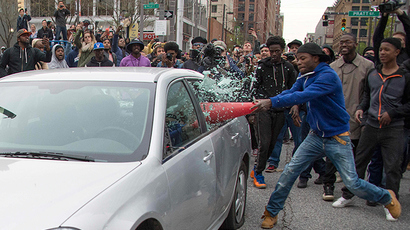 Wearing a blue hooded sweatshirt, he is clearly visible in photographs and video recordings of a riot outside the Camden Yards baseball stadium, using a traffic cone to smash the windows of a Baltimore PD cruiser. “I took it personally. I knew Freddie Gray personally. I feel as though I wanted to react in a different way. I did it out of anger. I regret everything I did," Bullock said at the hearing in February. Baltimore brimmed with anger in April 2015 after Gilmor Homes neighborhood resident Freddie Gray died in police custody. Gray, 25, was arrested on April 12 because he ran away from police after “making eye contact.” Later that day he was admitted to the hospital, comatose with his spine severed at the neck. He died a week later. Two days after the Camden Yards unrest, following Gray’s funeral, clashes between police and high school students in West Baltimore escalated into a riot. The National Guard was called in and the Maryland governor declared a state of emergency and imposed a curfew. Some 250 people were arrested before the emergency was lifted on May 6. Knowing that Bullock’s deeds were captured on film, his parents urged the teen to turn himself in. When he did so, on April 29, the judge set a $500,000 bail for his release. 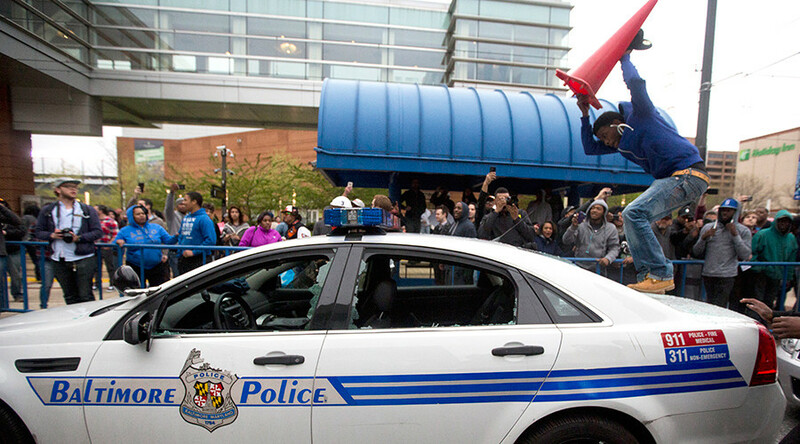 On May 1, when the six officers involved in Gray’s arrest were charged and arrested, the highest bail was $350,000. “Freddie Gray will never be back. Those windows will,” McKesson said. The local community and nationwide donors eventually raised the half a million and bailed Bullock out, but he still faced the possibility of spending his life in prison for the charge of rioting. Though he had run afoul of the law as a juvenile, the eight misdemeanors were his first criminal charges as an adult. Earlier this month, the US Department of Justice sent out a letter advising local courts to be more lenient to “individuals accused of misdemeanors, quasi-criminal ordinance violations, or civil infractions.” Among the recommendations was sentencing such individuals to community service instead of fines or jail time.